Rustic colors give a rural nature inspired wedding a cozy touch. Whether you are getting married in a garden, barn, or even in the middle of a bustling city, this color palette is always a winner! Rustic colors are within the more subdued spectrum of the color palette. They are not pastels, and certainly not overly bright. Think old boards in a barn, a vineyard ready for harvest, a tired pump by the well, ripe wheat on the field, that rusty old weather vane, those wildflowers popping here and there, the ever changing woods, and that once bright and colorful farm that may have lost its luster but has gained the charm of age. Although generally soft and muted, rich and deep shades of color can be considered rustic as well. So long as you avoid bright, tropical, neon-like colors you can easily bring some rustic flavor, through the use of color, to any wedding. 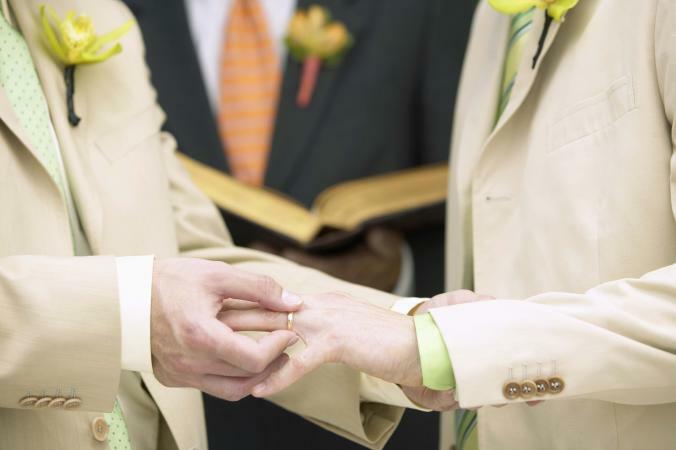 Ideally, you want to consider your wedding venue when choosing a color scheme, especially for rustic weddings. 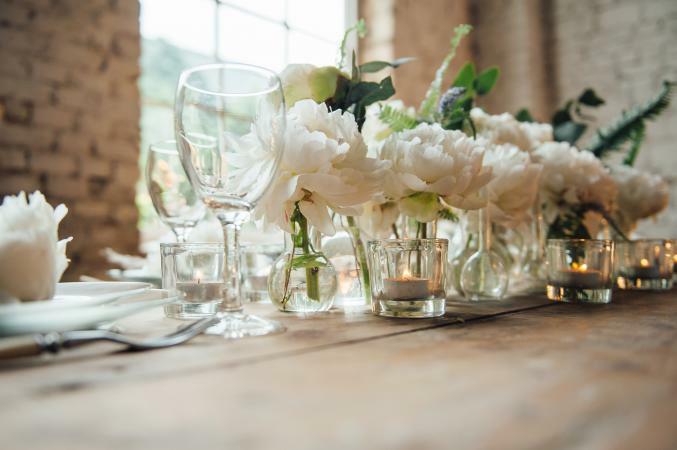 Even if the general feel of your venue is not quite rustic, taking into account the predominant colors and style of the location can help you decide how to incorporate your choice of rustic colors. Adding accents to your and your fiance's attire is a great way to include your rustic color scheme. It can be just an accent like adding a sash or a tie, or even choosing your outfits to match your colors. While the bridal attendants often wear one of the wedding colors, the men can incorporate the scheme into their attire as well. For example, the men can wear dress shirts and ties that feature two complementary colors like yellow and green, but choose suits in shades of beige. Backing away from black and selecting neutral beige offers a rustic feel to a ceremony. 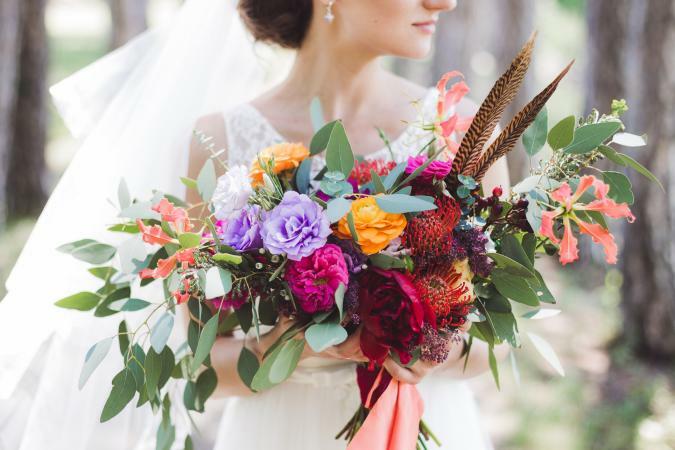 Choosing flowers in your preferred color scheme may be the easiest option. You can create a rustic feel not only through the color of the flowers but also through the design. Adding in loose greenery, cattails, feathers, burlap wraps, and other rustic elements will help enhance the colors and the theme. Combine cool lavender, peach, coopers, and orange with forest greens in a large boho spray that evokes a rustic feel and look. This is a great way to incorporate your selected color scheme but also add in a few other rustic colors for a multi-hued design. Rustic elements in the right color scheme can really bring that homey feeling to any venue. Table runners, centerpieces, and even the dinnerware can all be chosen to include your colors. Create a setting featuring sage green, rose pink, browns, and whites for a romantic rustic look in the center of your guest tables. 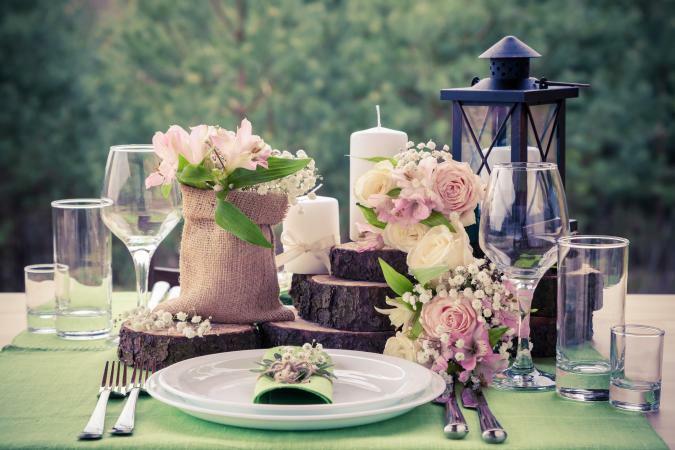 The greenery in the floral centerpieces matches the placemats and the brown burlap complements the deeper wood slices. Soft pink roses add a dreamy feel. If you use rustic decor elements, you can heighten the experience even more. Rustic candles, old-fashioned pails and containers, mason jars, wicker baskets, and other nature and rural-inspired elements can be chosen to match your rustic color scheme. You can decide to use just one of your rustic colors from the palette, such as burgundy or orange, in certain areas, like centerpieces, and then accent with tableware and florals in neutral creams, browns, and whites - or vice versa. Sheer fabrics in neutral cream and warm whites can add an ethereal feel to any rustic setting and can help cover walls or windows as needed. 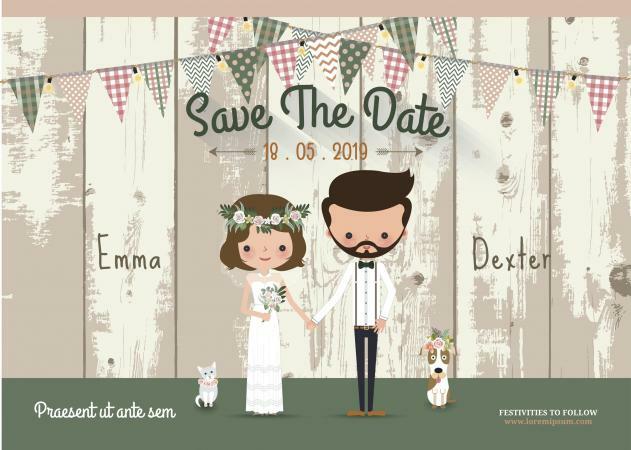 You can design your save-the-dates, invitations, and thank yous with your rustic color scheme in mind, whether you DIY them or have them printed professionally. This is a great way to set the tone for your rustic wedding. Using dusty rose with green and a cute country design featuring wood boards and graphics that look hand-drawn is a great way to incorporate color plus a rustic feel. Whether they sit in a special table waiting to be picked by your lucky guests or are included as part of the table setting, favors are a wonderful way to include your rustic color scheme. Consider using ribbons, cards, bags, and wrapping in your color scheme of choice. The packaging is a great place to use darker jewel tones, such as ruby red, or metallics like burnished gold. Bonus points for choosing a rustic wedding favor. Use your colors in the decoration of buffet tables and food stations or in the actual food and beverages. A signature drink or two can be designed to match your colors, or you can simply use garnish or decorations to tie them with your color scheme. From blood orange garnishes to burgundy wines, the options for creating a cocktail are endless. The same applies to food stations, include your colors in the runners, the decor, or even chose a food theme to match your colors. 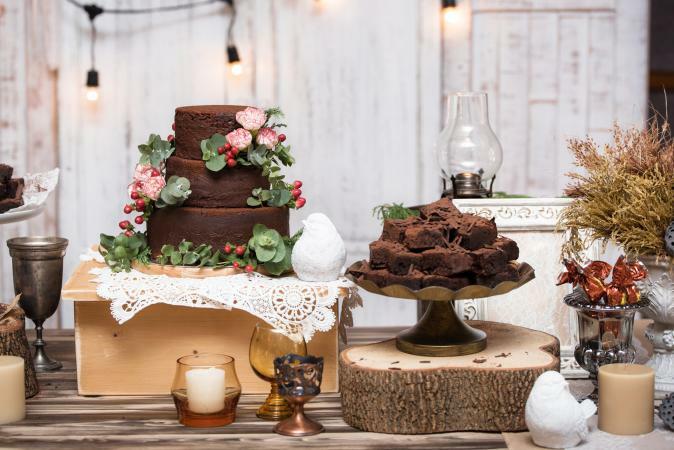 A delicious dessert table with a rustic wedding cake and treats in your colors of choice can be the highlight of the banquet hall and a great way to make a statement. Neutral browns and creams accented by copper decorations create a lovely setting for mocha-colored desserts. The simple hues highlight the cranberry, olive, and rose-colored decorations on the wedding cake. Using a rustic color scheme can help bring that warm charming rustic feel to any venue. Just choose your colors within the rustic colors palette and the great old barn is optional!